Readers often ask me why I rarely review French skincare brands like Avene. Simple: I don’t need it. Avene & co are for sensitive skin that throws a tantrum every time it meets retinol, any kind of exfoliant or… well, pretty much anything else you throw at it. For Avene, simplicity is the name of the game: lots of moisturizing ingredients that can soothe skin and strengthen the skin’s protective barrier to keep it safe from cold weather, germs and co. Anything that could irritate skin, including powerful anti-aging superstars like retinol and glycolic acid, are out (but for some reason, Avene usually keeps the fragrance in, mmm). I know it’s frustrating but if you’re dealing with rosacea, eczema, or uber sensitive skin, staying away from those actives – at least until your skin has fully healed – and focusing on moisture is the way to go. Looking for a gentle cleanser that won’t irritate your super sensitive skin? Avene Tolerance Extreme Cleansing Lotion fits the bill perfectly. It uses a gentle mix of emollients that melts away all kinds of impurities: dirt, sweat, makeup… you name it, it takes it off. While it’s at it, it also moisturises and soothes skin, leaving your skin soft and smooth. If you have rosacea, irritations or just sensitive skin, grab yourself a tube ASAP. Worried about anti-aging but your skin can’t take retinol? Avene Physiolift Night Smoothing, Regenerating Balm uses the next best thing: retinal (short for retinaldehyde). This form of vitamin A works like retinol, but it’s way gentler. Put another way, it fights free radicals and boosts collagen production without irritating skin. The catch? There’s not too much retinal here. Your skin is sensitive, so it’s best to start with a small dose first. Sure, it’ll take longer to see results but hey, you can’t have everything. The real problem is the fragrance, but if that doesn’t bother your skin, this is still worth a try. Related: Is Retinal A Better Alternative To Retinol? Dry, sensitive skin that itches and flakes? Avene Rich Skin Recovery Cream is just what the doctor ordered for you. It uses a mix of Squalane, shea butter and mineral oil to create a barrier on the skin that keeps moisture in and protects it from external enemies like harsh winds and germs. I know what you’re thinking. Isn’t mineral oil the devil incarnate? Nope. Mineral oil undergoes a strict purifying process that removes all its toxins and makes it 100% safe even for the most sensitive of skin types. Try it if you don’t believe me. Mineral sunscreen is the way to go if you have sensitive skin – no doubt about that. But coming across one that doesn’t turn your skin into a white, greasy mess ain’t no easy feat. That’s where Avene Tinted Mineral Fluid SPF 50+ comes in. It uses nanotechnology, a process that makes particles of zinc oxide and titanium dioxide (the UV filters to blame for the greasy, white cast) so small, they’re invisible to the naked eye. Translation: they become way more lightweight and transparent. Just to be on the safe side, this version has a tint. It prevents the white cast and allows you to skip foundation, too. Win win. Related: Is Nanotechnology In Sunscreen Bad? Focusing on moisture is all well and good but what about antioxidants? Even sensitive-skin gals need their antioxidants fix. As far as Avene goes, A-Oxidative Antioxidant Defense Serum is your best bet. It has its fair share of vitamins C and E to fight free radicals before they give you wrinkles. Plus, it’s moisturising and gives your skin a beautiful glow. It’s not as loaded with antioxidants as other serums, but if your skin is sensitive, start small. Give this a try and if you’re fine with it, you can always upgrade to something else later on. 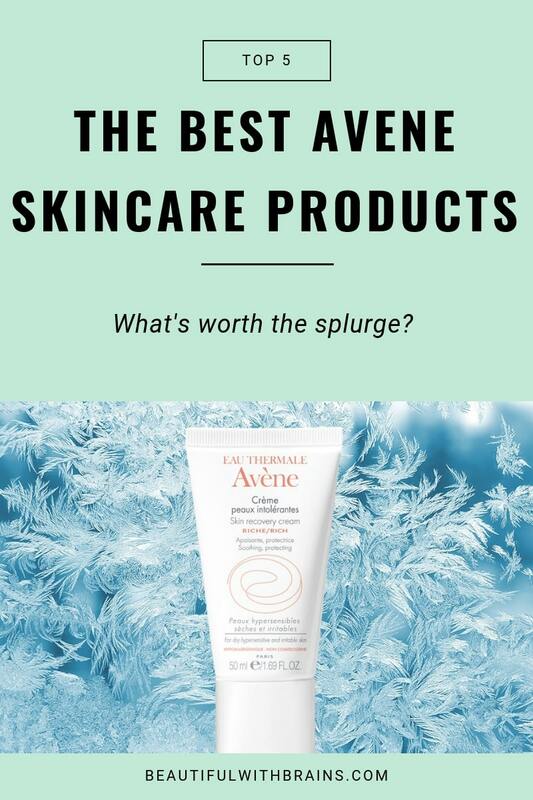 What do you think are the best Avene skincare products? Curious your thoughts on Avene’s Retrinal products (one of the lucky fragrance free products in their lines!) and if there was a reason they didn’t make your Avene top 5 list. I know you’ve written about retinaldehyde before – I’ve read here and elsewhere that it’s less irritating than but equally effective as regular OTC retinol (one less conversion). It’s pretty hard to find products with retinaldehyde, so I’d think Avene gets bonus points for using it!